High uric acid blood levels are not usually considered a health problem by the people, generally because there are no specific or severe symptoms or damage, but elevated uric acid levels if sustain for long periods of time may prove to cause chronic disorders and organ damage. Uric acid is the natural breakdown product of purines, that is produced as a result of the body's normal metabolising processes, its blood levels can also increase due to diet rich of purines. Uric acid is basically a heterogeneous nitrogenous compound, it forms ionic crystals called urates. As uric acid is the breakdown product it is also called waste metabolite. Mostly it is filtered by kidneys and excreted by urine, some quantity is excreted through stool too. Normal uric acid blood levels range from 3-5 mg/dl, depending upon laboratories and test equipment. Hyperuricemia may be due to elevated blood levels of uric acid due to high purine diet, any pathological condition or it may occur due to less excretion of uric acid by the kidneys. 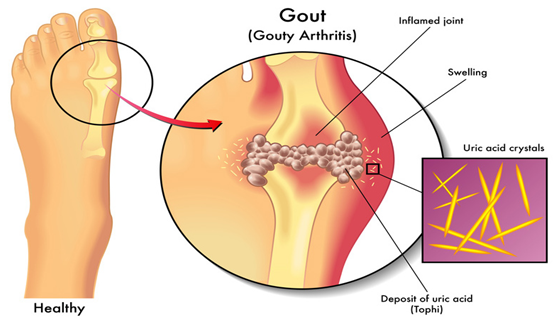 Gout is a painful state caused due to the deposition of urate crystals in the joints causing inflammation. 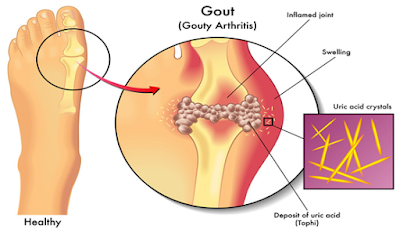 High uric acid levels may not always cause gout. The chronic and sustained hyperuricemia may be due to one or more causative factors that include acidosis, diabetes, alcoholism, pregnancy, lead poisoning, hypothyroidism, leukemia, excess of exercise, renal insufficiency, niacin, psoriasis etc. Hyperuricemia may lead to kidney damage and kidney stones. Gout and Rheumatoid Arthiritis are also associated with hyperuricemia. Lesh-Nyhan, a very rare disorder is also caused due to higher uric acid levels. The patients with elevated uric acid levels should avoid high purine rich foods like meat, pulses, doughnuts, egg yolk, whole milk, liver and other organ meat also highly saturated fats like butter and overall fried food should be restricted. Patients with hyperuricemia are recommended to take oats, vegetables, fresh fruits, lean meat, dairy products, dried beans that are high in fiber that lower cholesterol levels. For cooking sunflower, corn and olive oil should be used. Hyperuricemic patients should exercise or walk regularly, consume atleast 2-3 litres of water daily and avoid alcohol. Modify the cooking style and adopt roasting, baking, steaming or grilling the food rather than deep frying. If the patient is suffering from Gout then first we need to treat inflammation and pain, for this purpose NSAIDs (A class of anti-inflammatory drugs) like Ibuprofen, Diclofenac sodium etc are used to relieve the patient from pain and inflammation. Allopurinol is given to the patient as the first choice drug lately to lower the uric acid levels. This drug work by inhibiting the re-absorption of the uric acid in the kidneys so accelerating its rate of excretion.It is also prescribed to patients suffering from kidney stones. Allopurinol is administered after the meal to avoid stomach irritation, its dose depends on the condition of the patient. If patient suffers from side effects like nausea, vomiting, diarrhea, weight loss, eye pain, pale skin after the administration of this drug, consult the Doctor immediately. Allopurinol can interact with diuretics, mercaptopurine, cyclosporine, azathioprine, chlorpropamide, antibiotics like ampicillin or amoxicillin and blood thinners like aspirin or warfarin. So before taking Allopurinol do discuss with the doctor if you are taking any of the above mentioned medicines.